Chances are if you are into car shows you have been to or at least heard of Hot Import Nights. 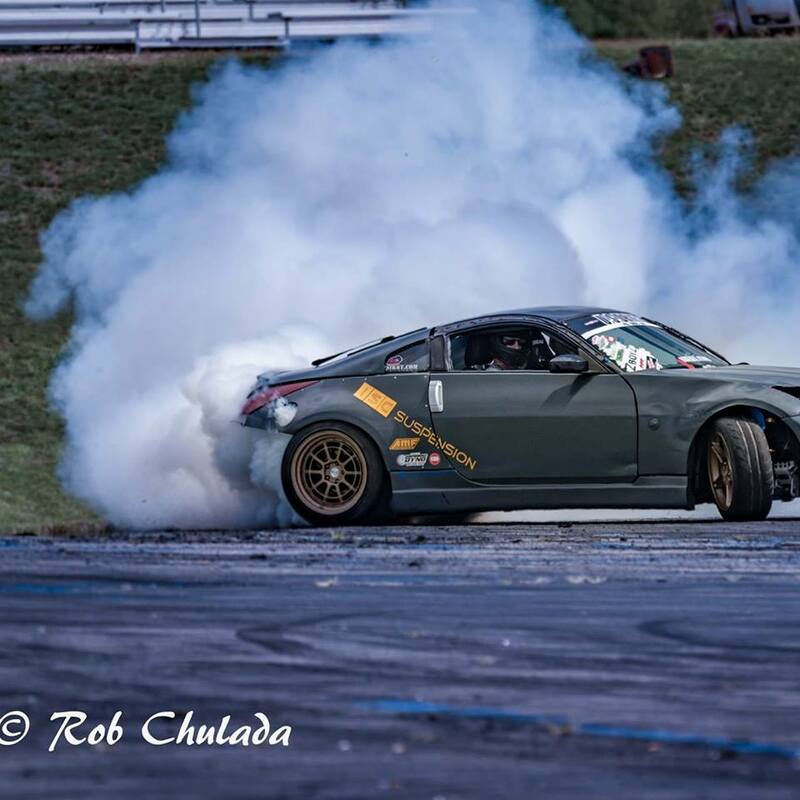 Each year HIN hosts an event in Loudon New Hampshire at New Hampshire Motor Speedway (NHMS). The NH HIN has a unique twist with the local ClubLoose North drift series being a part of it. Music, car show, and drifting, what more could you ask for? Well how about drifting not only in the normal CLN lot, but also drifting on the speedway during the HIN event!? Car show enthusiasts, competitors and drifters travel from all around New England to attend this annual event, and it is certainly worth it. One of the highlights of the drift event was watching Phil Oddo and his teammate Nate Richards attack the road course at the speedway during the event. Both are U.S. Drift Pro/Am competitors and Phil recently came on board with us at ISC. It was a great opportunity to see his driving first hand, and also dial in his new custom ISC N1 coilovers that give his 400+ WHP 350z drift car the grip it needs when it matters most. We can’t wait to see what Phil has in store for the rest of the 2017 season, and can only imagine what 2018 U.S. Drift will do for him! Hank and Henry are a father and son team that have been creating a lot of buzz, and there is a good reason for it; Henry is 14 years old! They attended a Team O’Neil Drift School a few months back and fell in love with the sport, you could tell they were hooked. We suggested they come check out ClubLoose North with us if they wanted to get into drifting, and the rest is history. AJW Performance built them a 350z prepped drift car that was just recently completed, and these guys hit the ground running. Henry is the youngest member of the TeamGold ISC Drift Team by about 10 years, and they are our only father and son team. It is an awesome dynamic to see first-hand, and truly unique. For the past few years when many kids were at soccer practice or T-Ball, Hank and Henry were Kart Racing, going 60+ MPH 2 inches off the ground around various tracks in New England. Henry was able to move up into B class within a few hours at his first event last month. The progression, motor skills and throttle control are second to none, and we can’t wait to see where a full season will take him. After a few practice runs Henry got the hang of the high speed entry on the speedway track, emphasizing his unique talent of rapid progression in the sport of drift. These 3 amigos came on board just recently as well, although long time drift companions they are now officially part of the team. If you want to see synchronized 3 way tandem’s with near matching cars, these are your guys. Crushing A-Group this year we are looking forward to seeing what the future brings. I also look forward to getting back in the driver’s seat and adding some yellow to their tandem trains! We are excited to have them on board, and look forward to the remaining of 2017 season, and what is to come in 2018. Marty came out of hibernation with his turbocharged Mazda Miata to join the festivities. After a few warm up laps he was back out there tearing it up. It’s always awesome to watch this little angry Miata screaming around the track. Joel Richards of Joel Richards Motorsports had a successful day. After many mechanical challenges over recent events his 475+ WHP Nissan was running great and destroying tires. If you didn’t see the car, chances are at some point you heard it, as his Ford V8 engine makes its presence known. Plagued by an unknown engine issue the past few events the ISZ was destined as a booth queen after a few attempted runs on the CLN lot. It was like being a kid in a candy store, but not being allowed to eat any candy, or something like that. We will most likely be laying low for the rest of the season and plan for our LS1 swap, so next year we can have a fresh start with a 400 WHP V8. For old times sake here are a couple of throwback images from 2016 Hot Import Nights/ ClubLoose North when the car was up and running! Chris of Team Hostile was holding it down in the Hot Import Night’s car show with his 2014 Chevy Cruze RS. Sitting on ISC N1’s along with some tasteful visual modifications it is certainly a head turner at any show. It’s not every day we get to see a Chevy Cruze with this much work done to it. Chris has been with us for a while and historically has had Subarus and Hondas on our coilovers and competed in many car shows with those vehicles as well. Thanks for the support Chris! Hetmin entered HIN in his Toyota Camry which is sitting on ISC N1 Street Comforts. You will see this car riding low in the Lakes Region area on the regular. Rob Blanchet as always being smooth and consistent, top off and smiling. Great event, perfect weather, and fun times had by all. Until next year! Photographers (including but not limited to): Emily Marchand, Wayne Deslaurers, and Rob Chulada.